As Philly Beer Week hangover recedes, what does future hold for the event? 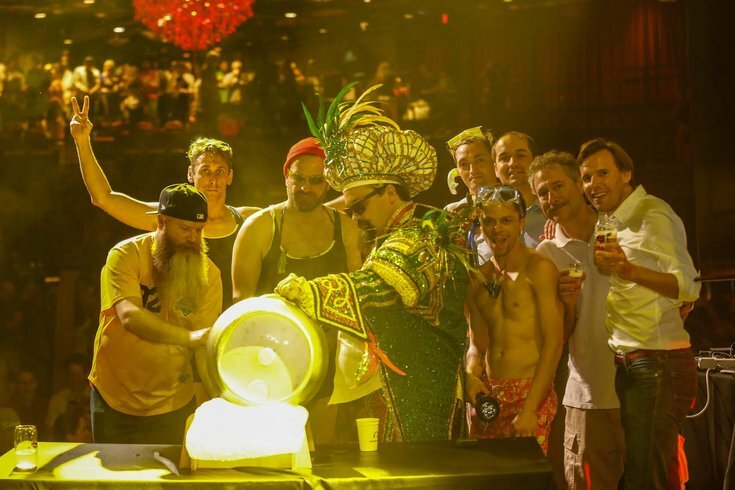 Philly Loves Beer president Casey Parker (center, wearing Jason Kelce's Mummers outfit) takes center stage at Philly Beer Week's Opening Tap event on June 1, 2018. The tip from “a concerned beer drinker” arrived smack dab in the middle of this month’s Philly Beer Week. It was dire, angry and emblematic of what seems to be a never-ending beef within certain elements of the regional suds community. “I wanted to drop you a little tip about the impending implosion of Philly Beer Week,” it read. “Philadelphia is the only city in the country that has a ‘Beer Week’ that does not focus on local beer and is not run by local breweries. Those words ran counter to the spirit of pictures and accounts of this year’s Beer Week, which ran for 10 days starting with the Opening Tap at the Fillmore on June 1. We asked those involved in the annual event – from organizers past and present to local brewers – what they saw for the future, and what they made of criticisms that many of them heard (or made) countless times before. They all grappled with one big question: How will Beer Week evolve at a time when there are substantially more local breweries than existed at the event’s creation 11 years ago? In November 2016, “Philly Beer Week” rebranded as “Philly Loves Beer" to represent its overarching presence. The move was designed to help it grow beyond an event-focused title into a year-round effort to promote local beers, among other things. When we spoke recently, Casey Parker – the president of Philly Loves Beer – was still exhausted from what he deemed an “incredible” event that saw the diehard Eagles fan wearing Jason Kelce’s Mummers outfit for the Opening Tap gathering. His first reaction was an audible sigh. The notion of competition always took a backseat to collaboration and celebration, he maintained. Yes, there was an “odd level of fatigue,” but that’s since disappeared, he said. “We’re never going to serve crap,” he said. “We’re always going to support local breweries, but we’re never going to force all the lines to be all local because that’s not what ‘Philly beer’ is. I’m always skeptical when a brewery all of a sudden drops into our market, wondering whether they’re trying to raise their profile and sell out to a microbrewery. 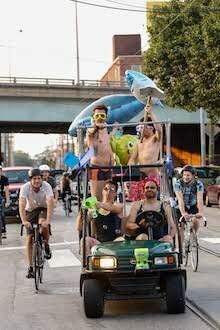 Scenes from Philly Beer Week's 'Hammer of Glory' relay. Sure, the number of events have been pared down of the year, but inclusivity has not been. “If it’s good, we’ll pour your beer all year long. How is that non-inclusive?” he said of the expansion beyond a 10-day celebration. That’s not to say there won’t be challenges, of course. Mike “Scoats” Scotese first brought craft beer to the market at Northeast Philly’s Grey Lodge Pub. He now runs Hop Angel Brauhaus, Sawtown Tavern and Bonk’s Bar. He’s the type of guy who’s attuned to local-brew intricacies. Scotese agreed with Parker about the event always including a lot of local breweries. "This year was no different,” he said, noting that the business’s evolution has had an impact over the course of more than a decade. He stepped back and spoke about the challenges inherent in the shifting marketplace from a bar-owner's perspective. Substantially more breweries in the region mean substantially more tasting rooms connected to those businesses. Fans of those beers are more likely to head to the brewery instead of a bar. By that, he meant that there are more beer events with each passing year. Social media gets word out to fans of a particular beer quickly. “People feel they can stay home and that there will be another event tomorrow because beer is everywhere,” he said. “It used to be rare, a big deal, when a brewery released a new beer. Now, it’s available on supermarket shelves. He cautioned that he’s not trying to sound negative about the evolution, but that many bars are now in a position that they have to rely on their restaurant side for financial success. He also noted that Philly Beer Week “has the misfortune of succeeding beyond our wildest expectations." Still, that's not necessarily an overtly bad thing. “I don’t think it’s going away,” he said. “We needed to change and that’s what the year-long mission could do. Still, he's of the mind that Beer Week should highlight local breweries as events like this were "about the city they take place at." That said, collaborations with outside breweries "make it more exciting." To Covaleski, there's a trickle-down angle. Rather than it being an overarching philosophy, retailers, taverns and bars should host the sorts of events they want to host, whether that be all local, collaboration or otherwise. "I've never been a proponent of controlling the experience and what retailers do," he said. "In essence, you're already seeing that ideal embraced with the name change from 'Philly Beer Week' to 'Philly Loves Beer.' They've already taken their hands off the wheel." To hear a trio of local brewers tell it, they’re not all that concerned about the inclusion of beers from outside the region in the festivities, either. "There’s no downside to being part of it." – Tim Gill, Wissahickon Brewing Co.
Sure, they can get overshadowed by bigger breweries with marketing budgets, but Gill maintained that wrinkle stands separate from what Philly Beer Week can do for operations the size of Wissahickon. He said Wissahickon got a nice bump from being involved with a few Beer Week events earlier this month. 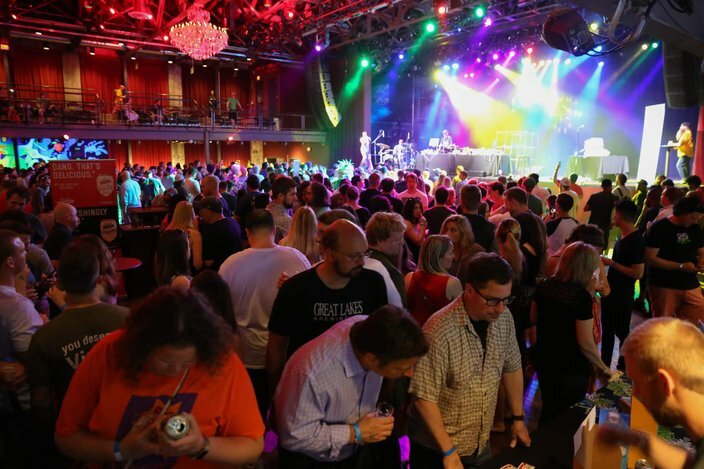 Despite complaints of an event potentially having run its course, an estimated 1,100 people attended Philly Beer Week's Opening Tap event at the Filmore on June 1, 2018. “We would not have had those opportunities without Beer Week,” he said. “It helps us put a face to our products. Regardless of how big it is, it will boost craft beer awareness and help get everyone rowing the boat in the same direction. There’s no downside to being part of it." In a similar situation was Sean Arsenault of South Philly’s Brewery Ars which he and his brother opened on Passyunk Avenue less than two years ago. Tim Patton of Saint Benjamin Brewing Company in Kensington said he’s always appreciated Philadelphia’s ability to draw top-notch brews from out of town. He deemed it an “amazing beer-importing city,” which can lead to “lockout,” meaning fewer spaces on taps at Philadelphia’s bars, he said. Looking in from the outside this year was Don Russell, aka Joe Sixpack, who formerly helmed the event but who said he left “on my own accord” after a “disagreement over the direction it was taking” several years back. He kept a positive tact going during a recent interview at Dawson Street Pub in Manayunk, but the conversation kept coming back to an evolving market and a difficulty getting word out about the events. "The energy behind it is still strong, but it's much smaller today," he said. "It's a shame. This was the first (beer fest) in the nation." “I always felt it could be much bigger than it is,” he said, alluding to financial constraints that both he, and the current board, acknowledged (albeit for different reasons). Though the current board is confident it can, Russell questioned whether the “year-round presence” could be accomplished despite those budget constraints. There are some philosophical contradictions as well. Ironically, both the old and new guard are both branching out onto the web to help bolster local beers in the Philadelphia market. The Philly Loves Beer website is being utilized as a promotional tool considerably more effective than the previous site. It's the group's way of overcoming promotional issues brought on by a waning print-media industry. For his part, Russell waited until Philly Beer Week ended to launch his website centered on local brews: Philly Beer World. He sees it as a way to, with ad sales, bolster local coverage of the beer world at a time when he thinks it's lacking. He also hopes it can help bolster Philadelphia as a "beer tourism destination." Whether the sites will turn into rivals remains to be seen. Heck, that may not even be the purpose, considering everyone involved has increased awareness about beer in the market as their driving force. The Philly Loves Beer board is meeting Tuesday to reflect on the Beer Week's successes and lessons, at which point they'll crunch numbers regarding attendance and impact. The group's executive director, Christina Dowd, offered up some anecdotal evidence that backed Parker's take on the event. “I went to four to seven events every day," she said, "and I never walked into any sort of empty room." Those who love Philly Loves Beer hope that's a common refrain for years to come, putting anonymous whispers of its demise to rest.